As a product that was once the darling of thousands of service shops across America, Benwil is still a much-recognized name among auto technicians and car enthusiasts. SVI is a leading supplier of Benwil lift parts for repair, maintenance and upkeep. SVI has most of the original engineering drawings and nearly 2,000 different repair parts for your Benwil auto lifts available. From arm restraint parts to cables and power units, one call truly does it all. And, it doesn’t matter if you own a 2-post or 4-post surface mount lift or any of the once available Benwil in-ground auto lift models, SVI has you covered. Gone but not yet forgotten, Benwil enjoyed a prosperous but short lifespan relative to others in the lift industry. During the 1980’s and into the 1990’s Benwil found itself in the right place at the right time. Unfounded concerns were mounting over other styles of lifts and Benwil ended up being the featured auto lift equipment product in the General Motors dealer equipment program and in Chrysler’s Pentastar equipment program. 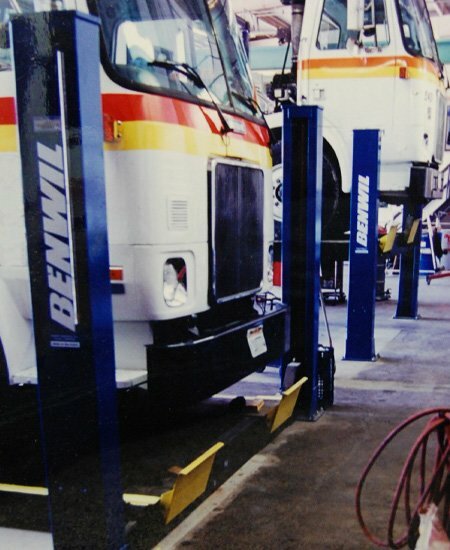 This meant new auto dealerships all over the country were being built featuring Benwil auto lifts almost exclusively in their service centers. Top lift repair professionals insist on genuine SVI Direct Fit brand auto lift repair parts for not just Benwil but all other makes of auto lifts. Put Team SVI to work for you today and keep your auto lifts in top working order for the long run. Don’t replace it, repair it. For Benwil and all the rest -- SVI is your answer.